So after record high temps well into the 90's for the past couple of days, the struggle between the Winter Gods and the Summer Gods has taken a turn. Today it is 35 degrees cooler than it was 2 days ago. The winds are brisk and it is downright chilly out!! So yes, Fall has arrived. BAM! So...because it is feeling so very Fallish outside my house right now, I bring you Pumpkin Scones with Cream Cheese Glaze...and let me tell you...perfect!! I've been playing around with a recipe I found on Allrecipes a few days ago for scones. It was "faceless" (needed a picture) and it happened to be a recipe submitted by fellow Allstar, Paula who also has a wonderful food blog called The Rusty Spatula. It's a great recipe. 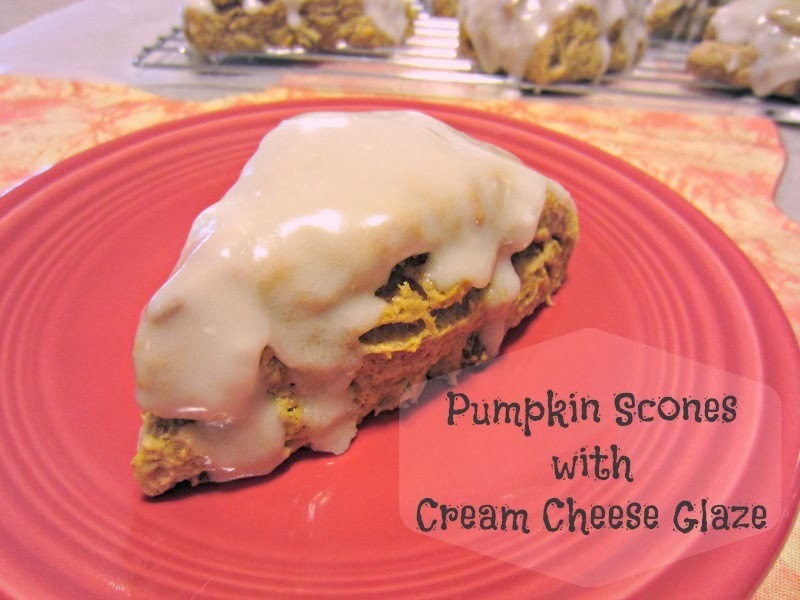 I have made Banana Scones, Blueberry Orange Buttermilk Scones with Orange Glaze (perhaps a post for another day), and today these delicious Pumpkin Scones with Cream Cheese Glaze. These scones are light, flaky and just a tad drier than a good buttermilk biscuit. If you have never enjoyed a scone, you really need to. Think sweet biscuit with flavors. Make sure your butter is COLD. I mean, you can even cut it up into chunks and stick it in the freezer for a few minutes while you prepare the rest of the ingredients. Less is more. Mix and handle the dough as little and as gently as possible once the dry and wet ingredients are combined. When cutting the wedges, use a smooth edged knife (not serrated) and use a straight up and down movement to cut. DO not saw the pieces or they will not rise well. Make sure you oven is pre-heated to the correct temperature given in the recipe before you put your scones in to bake. This will allow maximum rise and help them be light and flaky. These scones really "hit the spot" for breakfast today, still warm from the oven with the glaze all oozing, along side my warm cup of coffee. These scones are HUGE!! They are an indulgent 9pp when they are divided up by 8, but if you make mini scones, you can enjoy one for 5pp. Directions for making mini scones can be found below. Preheat oven to 425 degrees F. Line large baking sheet with parchment OR a slipat liner. In small bowl or large glass measure, combine the pumpkin, buttermilk, egg, and vanilla extract. Set aside. In food processor, add flour, brown sugar, salt, baking powder, baking soda, cinnamon, ginger, nutmeg, and cloves. Pulse a few times to combine. Pour the flour-butter mixture into large bowl, make a well in the middle, and pour the pumpkin mixture into the center. Mix with wooden spoon just until combined. Add in the raisins. Dump the dough onto a lightly floured surface and knead gently a few times to combine. Shape into a disc about 1 inch thick and cut like a pie, into 8 slices. Place slices on prepared baking sheet about 2" apart. Bake in 425 degree oven for 12 -15 minutes. Remove to wire rack to cool. While scones are baking, combine the cream cheese, vanilla extract and powdered sugar in small bowl until smooth. Add 2 - 3 TBS milk and mix until the glaze is thin and smooth. Spoon onto warm scones and allow set up. Enjoy warm or at room temp. Cover loosely to store. YUM...these scones were great!! If you want to cut down on the calories, you can make mini scones by forming two discs and cut both discs into 8 pieces, yielding 16 scones instead of 8. You may need to adjust baking time if you choose to make mini scones. I love the golden raisins in these, but I know many people are not raisin fans. You can omit the raisins or replace them with mini chocolate chips if you wish (nutrition information may change if you do either). The weather sure did change quickly this week. It's one of those crazy Lake Effect days here...sunny, cloudy, pouring rain, sunny...repeat. I'm not fond of Lake Effect at all. Has it turned fall where you are? Ha, I have to laugh at that blog title! Happy Friday! I remembered you do this and I think it's a great idea!! Then it's ready to go when you are! I'm so ready for fall and pinning pumpkin recipes left and right! I'm not a scone lover but I know I have to make these. Bring on pumpkin season! We cooled down a little, too, and I was so happy to turn on the oven and do some baking. These delicious looking scones are going on the list for the next cool-down!